World champion powerlifter Matt Kroczaleski came out as a transgender woman and rocked the fitness world. M&F was granted unprecedented access for a revealing feature in our October issue. 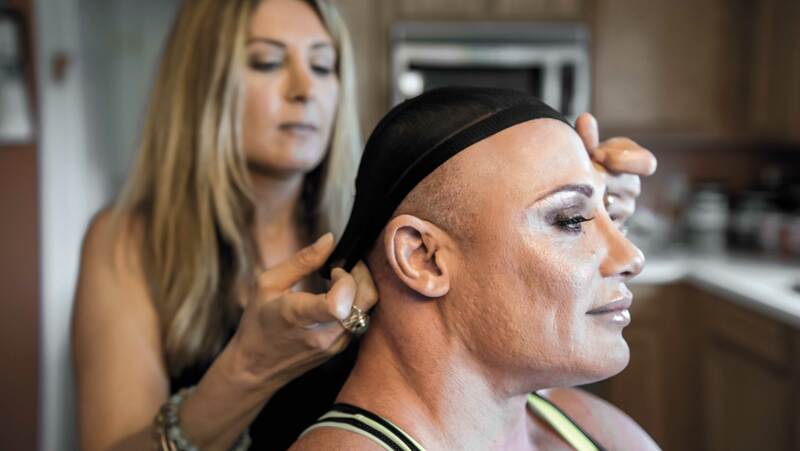 For the first time ever, M&F features a transgender athlete, Janae Marie Kroc, the bodybuilder and world champion powerlifter formerly known as Matt Kroczaleski. Since coming out as a transgender woman in July, Janae has granted interviews to a number of media outlets to talk about her unique story. However, our story is the first to feature a photo shoot of Janae. In addition, she has granted unprecedented access to her home and shared previously untold stories about growing up poor in the Michigan woods, and the path that led her to become a world champion in the world of strength sports. Any small underground gym gets the “dungeon” nickname by default, but the one that Matt Kroczaleski built in the basement of his suburban Michigan home in a cookie-cutter subdivision of Ypsilanti between Ann Arbor and Detroit is the only one you might confuse for an actual dungeon. The top half of the poured concrete walls is covered in blood-red spray paint; the bottom half in black. Dozens of heavy chains and thick rubber bands hang from pegs on the wall. All of it is standard power lifting gear, but the setting makes it look designed for torture. The sport of powerlifting exacts a toll on the body that is rivaled by only a handful of other extreme sports, but Matt, who fans simply called “Kroc,” had an uncommon obsession for shattering records that seemed to ignore all consequences. The price he paid came in the form of several muscle tears over the years: left calf, right quad, left lat, left pec, both biceps, and both triceps. The intracranial pressure accrued during his squat sessions twice caused severe hemorrhaging. That was just the cost of training. His particular brand of contest prep would kill most men. When cutting weight before a powerlifting meet, he could lose 35 pounds in a 24-hour period; he’d wear several sweat suits, get into his car in the middle of the summer, roll up the windows, turn the heat on full blast, and drive around for hours. Any weight he didn’t lose in the car came off in his bathroom, where, after stuffing all the vents with towels, he drove the temperature up to 150° by running a hot shower all night. He’d go in and out of his makeshift sauna for 30-minute bouts, forgoing sleep, until he hit his target. After the weigh-in, he could gain all the weight back by eating and drinking Gatorade nonstop until the meet. He didn’t just survive these bizarre rituals, he got on the lifting platform the next day and decimated the rest of the field. In 2009, he set the powerlifting world record in the 220-pound weight class, squatting 1,003 pounds, deadlifting 810, and benching 738 for a staggering three-lift total of 2,551. Suffice it to say the home gym was appropriate for the style of training Matt was known for. The monolift set against the wall saw some brutal, spine-crushing squat sessions. There’s a Texas Power Bar, thicker and 10 pounds heavier than a standard bar, meant to withstand the rigors of pro powerlifting. It is bent into a sharp, permanent parabola, useless, discarded in the corner. On the opposite side of the gym there is a jack to make it easier to load the bar with the amount of plates he needed for his deadlifting sessions; when you can pull more than 800 pounds, your rep work is in excess of 500. Neighbors didn’t complain of noise but that their houses shook when he dropped the weight. In one corner, there are shelves lined with old bodybuilding and powerlifting magazines, copies of Matt’s book, Insane Training, and his DVD, Intensity, alongside boxes of “Kroc Row” T-shirts. There are also several copies of an old issue of Power magazine with Matt on the cover for what was, at that time, an amazing transition—his shift from powerlifter to bodybuilder. Hidden under the stairs is another stack of old magazines: Cosmopolitan, Elle, Marie Claire, and Glamour. They were all saved for hair, makeup, and fashion ideas—for the day “Kroc” could fade away and Janae could reveal herself as the woman she always knew she was on the inside. On the day of her M&F photo shoot, Janae is sitting in a tall director’s chair in the middle of her kitchen. A makeup artist is working on a brand new look, and Janae is cooing throughout the process. At the moment, she still looks a lot like Matt. The 240 pounds of lean muscle she amassed during several decades of powerlifting and bodybuilding aren’t going away overnight. The haircut is another factor. She still sports a uniform standard high-and-tight fade that dates back to Matt’s days as a Marine working security for President Bill Clinton at Camp David.